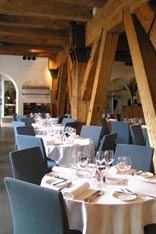 SALT Bar-Restaurant opened in 2003, and has contemporary appeal in a former 1787 granary in Copenhagen that was a warehouse for salt. 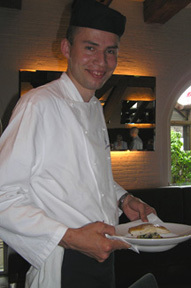 Rasmus Møller Nielsen is the Executive Chef responsible for the restaurant's creative menu. The ambience in SALT Bar-Restaurant features white painted brick walls, a beamed ceiling and wood beam pillars, mirrors hang on the walls, there are red and slate blue chairs, and slate blue banquettes line the walls. A large bouquet of white lilies and loaves of fresh bread and rolls are artistically arranged on a table in the center of the room, there is low background music, an open kitchen where diners can watch the chefs in action, and two small canons in the doorway. On the night Edward F. Nesta and I had dinner at the restaurant in May 2006, the tables were dressed with white linens, red roses sat in low square cut vases, red votive candles shined, pepper grinders and appropriate to the restaurant's name, three types of salt graced a special salt cellar with a selection of Laesø boiling salt from the Danish island of Laesø, Guerande Sel from France, and Maldon sea salt from Essex, England. Sommelier/Chef Søren Elley Calundann began our evening with an aperitif of Duval-Leroy Fleur de Champagne Brut to accompany tapioca crisps that were first cooked and then baked and topped with salt and paprika, crostini served with a basil-arugula pesto, and salted almonds. When he brought us homemade rolls made with porter and freshly baked bread, we tried each of the salts on the butter that was made at a dairy at a manor house in Steensgaard on the island of Funen, where we had stayed. All salts are definitely not created equal, and we enjoyed comparing the differences of each of the salts. Our tasting menu began with Fried Garfish and Norway Lobster with Polenta Crème and Rocambole (Stegt hornkisk og jomfruhummer med polentacreme og ramsløg, paired with Eroica Château Ste. Michelle, Dr. Loosen 2005 Riesling, Columbia Valley, Washington, with 12.5% alcohol, with a crisp apple nose, and apples, pears and gooseberries en bouche. 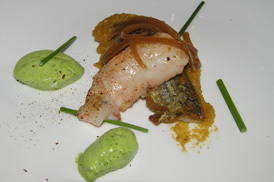 The wine complemented the sweetness of the lobster and the dryness of the garfish, which was at the height of the season. Edward continued with the Roasted Corn Cockerel with Preserved Rhubarb, Green Asparagus and Vichyssoise Foam (Stegt majsunghane med råsyltet rabarber, grønne asparges og vichyssoiseskum), paired with a Château Des Jacques, Clos du Grand Carquelin Moulin à Vent, Louis-Jadot 2000, from Beaujolais, France, 13% alcohol, made with 100% gamay, with a blackberry and tobacco nose, heavy tannins with blackberry and spice en bouche. 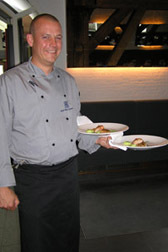 This presentation was quite interesting, as Chef Rasmus had prepared his recipe two ways. 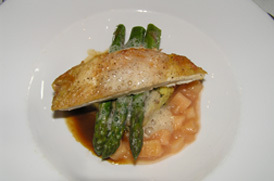 The rooster breast was grilled and served with a rhubarb compote, new potatoes, green asparagus and presented on a plate, and he had also prepared an accompanying salad using all of the ingredients in the main dish, with confit of rooster leg and long thinly shaved raw asparagus slices. My tasting continued with crispy exterior and succulent interior Fried Scallops topped with Frisee, with White asparagus, Dill Foam and Asparagus Soup served in a demitasse (Ristede kammuslinger med hvide asparges), paired with a E. Guigal Condrieu 2002, Rhone, France, with 13.5% alcohol, that had a fruity nose, and peaches, apricots and creamy acidity en bouche that complemented the sweetness of the scallops. 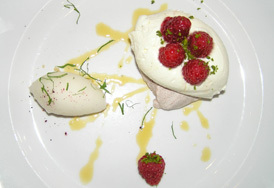 For dessert we had Lemon Pavlova with Raspberries, Macadamia Nuts and Manjari Chocolate (Citronpavlova med hindbær, macadaminianødder og manjarichokolade), which was asti spumante sorbet on a bed of toasted chopped macadamia nuts, raspberries adorned the lemon cream on meringue with a Manjari chocolate sauce, paired with a Vineland Estates Winery Vidal Icewine 2002, Vineland, Ontario, Canada, 9.5% alcohol, made with 100% vidal, that had a honey nose, with honey caramel and sweet peaches en bouche. The restaurant is located on the canal near the Amalienborg Palace, and at Søren's suggestion, we took a stroll after dinner through the Queen's Garden and by the Palace where serendipitously we were in time to see the changing of the Royal Palace Guards. Read Chefs' Recipes where Executive Chef Rasmus Møller Nielsen shares his tempting recipes in English and in Danish, for his Fried Garfish and Norway Lobster with Polenta Crème and Rocambole, and his Roasted Corn Cockerel with Preserved Rhubarb, Green Asparagus and Vichyssoise Foam. Read our articles on Denmark in the Destinations, Hotels and Resorts, Restaurants, Chefs' Recipes, Liquor Cabinet and Music Scene sections. For additional information on Denmark please contact VisitDenmark at www.visitdenmark.com and Wonderful Copenhagen ® at www.visitcopenhagen.com. For SAS Scandinavian Airlines information, please contact them at www.sas.se. For information on DSB rail service, please contact them at www.dsb.dk. © September 2006. Luxury Experience. www.LuxuryExperience.com. All rights reserved.